Hi, friends. I would like to know your opinions about a blade like this in a ballock. Would it be historic, plausible? I never saw a ballock with a blade that way and I wondered if it would be acceptable to make a ballock, with historical basis, with a blade like that. Thank you. i only would remove the grove. and make the blade smaller with the same lenght. I see. Thank you, Sir. But why to remove the grove? 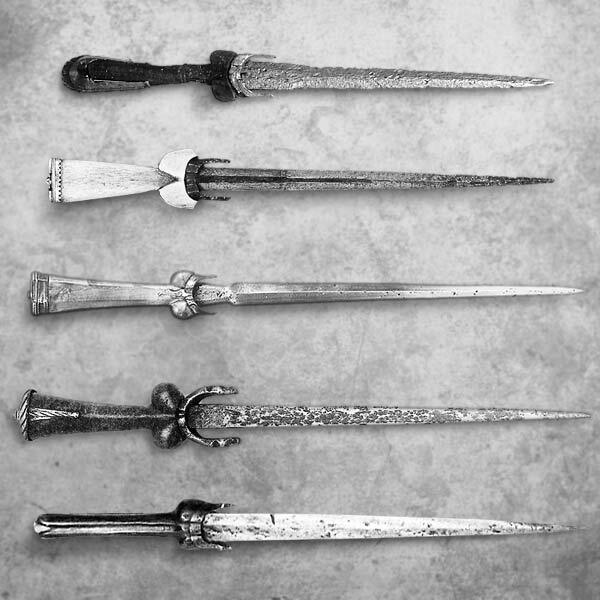 I can't recall ever see a bollock dagger blade with one. From the look of it, it's actually a very thick triangular pointed piece of steel, perhaps a Japanese yari spear head or a tanged arrowhead of some kind. Note the "front", "side" and "back" underneath each profile. Now if you're only going with the "front" profile, you probably want to make the "ricasso" between tang and blade a good bit shorter. Otherwise I see no issue with the profile. I see. Well i know at least one that has groves (verry narrow ones) and a very complex blade geometry. The pic of it is bellow. But, your idea to remove the grove is good nonetheless. Well, that image of three sides of the blade is a sketch i made to plan a blade to a balIock knife i will make, and I was thinking about to narrow the blade a bit. My main doubt remains about the blade shoulders. I see. But, i have seen images of ballocks with thick triangular blades. Well, that image of three sides of the blade is a sketch i made to plan a blade to a balIock knife i will make, and I was thinking about to narrow the blade a bit, and perhaps to reduce the thickness. Indeed the ricasso is quite big, and yet the image i posted in my reply to Mr. Anbeek is of a ballock with a long multi groved ricasso. Though the blade does not have shoulders. Just out of curiosity, where did that blade come from. Who made it?